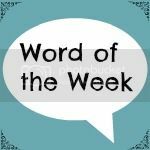 Share the post "Word of the Week 31/7/15"
We kicked off the week with a family get-together at my mum’s, which the children always love. We’ve then watched and played Star Wars more times than I care to recount, which has been a lot of fun for Little Man! We’ve been chatting about and planning for some new pets, which has included pet shops trips as part of our research, which we have all enjoyed. Then there have been a couple of brilliant play dates (thanks, Iona!) which have been a lot of fun, judging by the noise levels and general chaos! And now we are away for a few days, and staying in a hotel is always fun. So far we’ve had a day at Legoland, and we’ve taken the kids into London for the first time, with more fun lined up. So yes, as the school holidays should often be, it’s been all about fun this week. Lovely, fun week for you all. Hope you dodged the rain showers successfully at Legoland! It’s brill there, isn’t it. Oh it sounds like you have had a great week! I really want to go to Legoland, must book a trip! Sounds like you’re really enjoying the summer holidays and making the most of being able to get out and about whilst the rain holds off! Lots of fun, but isn’t that what summer hols should be about?! Awww your son is so cool for loving Star Wars! Its such a timeless classic and sounds like your week is really fun! Thought I’d left you a comment.. but I can’t see it.. oh well. Have another one! LOL!! What a great word and it sounds like it’s been a really fun week – I am hoping to take Boo to legoland as it just seems to be so fab and I have heard nothing but good things! We had a fab time!